Conservative libertarian Tucker Carlson ’87, P’15, ’18 (right) was in high demand this week. The Fox News talk show host and co-founder of The Daily Caller was a guest on NPR’s “Morning Edition” Monday to discuss the state of the G.O.P. in advance of the Republican National Convention. 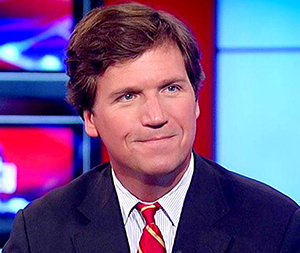 A weekend co-host of “Fox & Friends,” Tucker also joined the Fox weekday crew in Cleveland for its convention coverage. 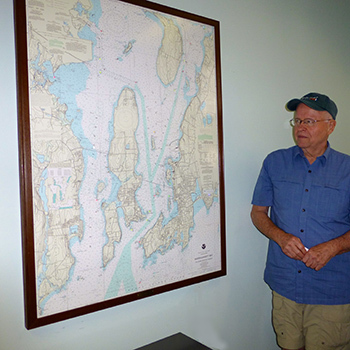 Carl Welshman ’57 (right) was on campus Wednesday to upgrade a lighted nautical chart he made and donated to the school upon his 50th reunion in 2007. Carl’s company, Harbour Lights, produces maps of any shoreline area, adding lights to mark navigational landmarks. For St. George’s map of Narragansett Bay, he added a special light to mark the Chapel. We love and appreciate this gift to the school, which will be on view in the new Academic Center this fall. The 2016 Newport Folk Festival begins today at Fort Adams. Best of luck, producer Jay Sweet ’88! Want to listen to the festival? Tunein.com is offering an audio live stream at http://tunein.com/radio/Newport-Folk-Festival-p400295/. SG piano teacher Lois Vaughan plays Bridgefest with her quintet on Tuesday at the Canfield House. Bridgefest, another celebration of music managed by Jay’s Newport Festivals Foundation, is meant to “bridge” the gap between the Newport Folk and Jazz Festivals. 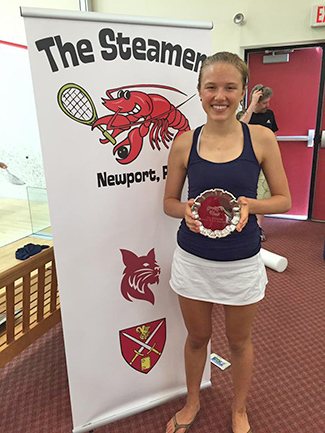 Rising fifth-former Ainsley Weber ’18 (right) took first place in the Women 4.5 Singles division of the Newport Steamer Squash Tournament held here in the Hoopes Squash Center last weekend. Former Dragon squash players Mike Kelly ’15 and Schuyler Livingston ’07 were also back on the Hilltop for the tournament. Mike, who now attends St. Lawrence University, worked as a volunteer. Schuyler also played in the Women 4.5 Singles division, in front of her family: brother Sam Livingston ’10, mom Mary and dad Dunbar Livingston ’68. Seven SG athletes were honored in the Providence Journal this week as Spring Independent All-Stars: A.J. Chicharro ’19 (golf), Will Logue ’16 (sailing), Erika Martin ’16 (softball), Harry Shepherd ’16 (tennis), Jonathan Tesoro ’16 (lacrosse), Irem Tural ’18 (track & field) and Josh Winkler ’16 (baseball). Great job, all! Congratulations to Tim Everitt P’17, who was the first to reply with the correct answer to last week’s trivia question about the “Modern Family” actor who addressed students at a Women in Leadership event this past spring: Julie Bowen ’87. Thank you to all who replied. Try again! If you like “Where’s Waldo,” you’ll like this week’s trivia question, which has a truly Hilltop theme: Be the first to tell us where this is on campus (right, but click on the link to view a larger photo) and you’ll win a coupon code for any purchase in our online school store. Be as specific as possible — and good luck! • Our Greenvale Vineyards reception in Portsmouth, R.I.: Thursday, Sept. 15, from 5:30-7:30 p.m.
• Our annual NYC reception for alumni and parents at the New York Yacht Club: Tuesday, Nov. 1. 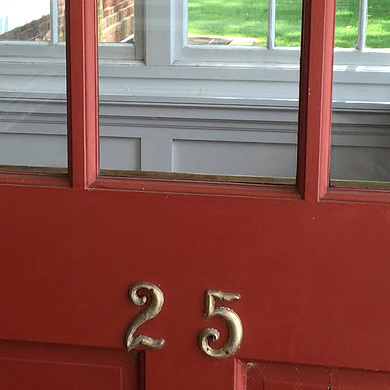 “Greetings from the Hilltop” is sent to our community every Friday. You can manage your email subscriptions any time.